I think these numbers truly show the effect of globalization. It's no longer the domestic market that is the primary focus as the international market is becoming more and more prominent. I've never understood why they focus on the domestic box office when it's the overall world BO that is the real bottom line. I am not sure it's the focus on domestic as much as it is the media's focus on negativity. If it had performed well domestically but it had "under performed" internationally then the international numbers would have been the focus. It's a sad state of mind but they dig to find fault in perfection. I find the connection between the type of movie or story line and the international success of that movie very interesting. For example: The story line for Cars is centered around the loss of classic Americana and one of the largest American past times NASCAR. This movie did lower internationally then domestic. Then you have a movie like Finding Nemo that was set outside the US and the major location of the story was a nationally neutral location (the ocean can't get any more neutral then that... well, maybe outer space. Over all this one did really well internationally. The reality is: global box office and DVD sales ARE part of the whole, regardless of what anyone says. They always have been but in recent years the importance of DVD in particualr has become a major piece of the overall picture. When you read about a "successful" film being a "disappointment" this is accountant spreadsheet speak. Every movie, video game, soda, clothing..you name it..has estimated projections for their performance. 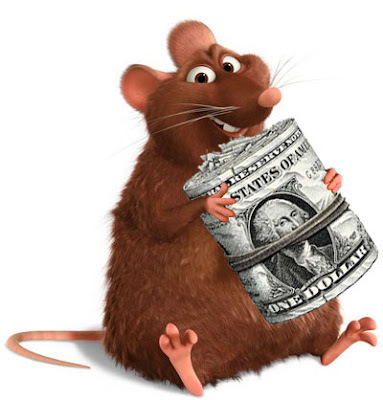 A film like Rat...it had a projection..and target domestic total. Did it hit its projection? Not really. The accountants are "disappointed".. the studio is "disappointed". But its the kind of disappointment you feel when you want to win the 100 million lottery and you "only" win 80 million. Disney was hoping for a better domestic take from POTC World's End, but with a worldwide take of nearly 1 billion....they're not loosing sleep over it.. While Rats predicted domestic BO was not met, its foreign predicted BO has been exceeded. The film is the 3rd biggest worldwide Pixar film! How can this be spun any way but positive? I'm curious...I was under the impression Foreign Box Office produced a lot less prophet than Domestic. Pretty sure it's almost half. That's why the Domestic is the true barometer...Anyone know how it really works? Thanks. In the last decade or so the international box office has really become the more important of the two. It's been a driving force since the late 90's. More often than not a film will do disappointing B.O. here and be a smashing success overseas. As we move into the next decade Disney and other film studios will be relying more and more on this market. It continues to become a larger piece of the pie and studios follow the money. That's why action films do so well overseas... you don't have to put a subtitle over a gunshot. So, in a long winded way I guess the answer I just gave to your question was... no. International is probably the most important part of a films theatrical release. That doesn't mean the domestic is not very important, just that the world we live in is getting smaller, but the Box Office receipts are getting bigger.